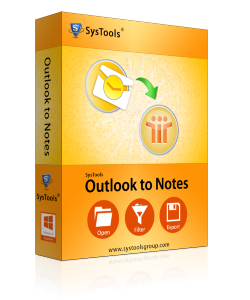 Free DEMO Version: The FREE Demo version of the Outlook to Notes software supports the conversion of 15 items from each mail folder. But for further conversion the purchase for the full licensed version of the Outlook to Notes software needs to be accomplished with the investment of $129 on the personal license and $229 on the business license. Want to Connect Outlook to Domino? Connect Outlook to Domino tool easily transfer the data of Outlook to domino Server after the Outlook to Notes conversion. Are you willing to connect Outlook to Domino Server? Do you want to change your email client with the help of third-party Outlook to NSF conversion tool? Are you seeking for some efficient third-party software for connecting Outlook to Domino process? Why Want to Connect Outlook to Domino Server? There are many reasons owing to which you can convert Outlook to Domino Server. Domino is the Server of Lotus Notes. This email application provides you many useful features like user level SPAM control, local encryption, digital signatures, virtualization support for hardware and software and lots more. For connecting Outlook to Domino, you can use a recommended software tool like Outlook to Notes software. This professional software has well versed beneficial features using which you can convert Outlook PST to Notes NSF. This software tool can easily convert Outlook to Domino. When you use this Outlook PST to Notes NSF software, you can competently connect Outlook to Domino and then, you can transfer all your Outlook mailbox items including emails, tasks, journals, calendar, contacts, notes, to-do list etc. This tool is tremendously easy in usage even a novice can use this software without any difficulty. Both demo and full version procedure are available. Availability in software installation and un-installation processes. Purchase Now – Full Version: The Full Licensed Version of Outlook to Notes Software ensures complete and unrestrivted conversion of email items of Outlook to Domino Server. You can use this tool easily for Connecting Outlook to Domino on almost all the Microsoft versions including 2007 and all other older versions).